Butterfly Effect, Oil Gusher & Edge of Chaos: World Wide Summit? Does the flap of a Butterfly's wings in Brazil set off a Tornado in Texas? How we strive for predictability, which eludes us more than ever before, yet we don't often stop to ask ourselves: why? According to the Butterfly Effect, the slightest disturbance in one part of the world can trigger a chain of events that create a hurricane in another part of the world. Let us just think about how fragile the earth is: from volcanoes to earthquakes and from sinkholes to an uncontrollable gusher spewing crude oil and gas at the bottom of the ocean. Sometimes people can joke, laugh and be dismissive of the Butterfly Effect and Chaos Theory. However, they are critical in shaping our thinking and our values. They predicate and have the capacity to modify our insatiable consumption. Given the amounts of oil polluting many parts of the world right now -- from the Niger Delta to the Gulf of Mexico -- we are all in for some heavy Butterfly Effects, whether we like it or not! Possible worlds, chaos theory and alternative reality scenarios are normally the exclusive domain of philosophers and quantum physicists, but such tricky concepts also often lend themselves well to the accessible narrative of what is happening with increasing frequency in our globalised world. As we push at the boundary conditions of our natural resource limits -- consuming as if there were 2.4 planets at our disposal as opposed to one -- we are inevitably having to go farther and deeper to exploit the earth's resources. The Roman philosopher Cicero observed more than two thousand years ago, "Everything is alive; everything is interconnected!" or "Omnia vivunt, omnia inter se conexa!" If so, every action, has the potential to change the infinite play's next scene! Mahatma Gandhi said, "Our beliefs become our thoughts. Our thoughts become our words. Our words become our actions. Our actions become our habits. Our habits become our values. Our values become our destiny!" If so, what are we doing to change our actions so that we may influence our one world destiny? According to the US based National Center for Atmospheric Research (NCAR), oil from the Gulf of Mexico may pass through to the mid-Atlantic ocean by this summer due to ocean currents. NCAR scientists' powerful computer simulation shows how the liquid released at the damaged "Macondo" well disperses and circulates, producing results that are independent of the total amount released. 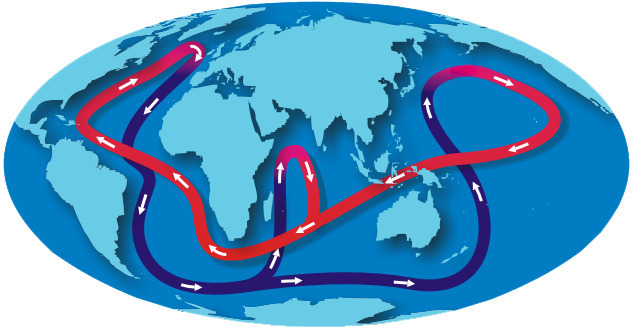 While ocean currents are shallow level circulations, the Great Ocean Conveyor Belt is global circulation which extends to the depths of the seas. Also called the thermohaline circulation, it is driven by differences in the density of the sea water which is controlled by its thermo or temperature, and its haline or salinity. Floating and submerged oil as well as the release of gases like Methane in vast quantities may alter both those parameters. What happens if some aspects of this step-by-step variation begin to extend to all the oceans? It is clear that the disturbance to the natural environment caused by the oil gusher is more than the flapping of the butterfly's wing, which represents but a small change in the initial condition of the system. Given the change that the unprecedented oil gusher is bringing about in the global ecosystem, this is likely to cause a chain of events leading to substantial large-scale phenomena. Had this butterfly not flapped its wings, the trajectory of the system might have been vastly different. It leads to the possibility of "Chaos", that whatever is the most unexpected thing at the time happens, ie, a true "Black Swan". As a result, nothing is predictable and even the slightest action can have the most complex reaction. According to the Upanishads, some of which date back nearly 3,000 years, "As is the human body, so is the cosmic body. As is the human mind, so is the cosmic mind. As is the microcosm, so is the macrocosm. As is the atom, so is the universe!" 1. The discovery of "Deterministic Chaos" brought about "one of the most dramatic changes in humankind's view of nature since Sir Isaac Newton," concluded the committee that awarded Lorenz the 1991 Kyoto Prize for basic sciences. The "Lorenz Attractor" is a relatively simple attractor with complex behaviour. This becomes the typical characteristic of chaos: the step by step manifestation of complexity out of simplicity. 2. The Butterfly Effect, the scientific concept that small effects lead to big changes, is illustrated by the Lorenz attractor. The butterfly was originally a seagull in Lorenz's paper written in 1963 for the New York Academy of Sciences. One meteorologist remarked that if the theory were correct, one flap of a seagull's wings would be enough to alter the course of the weather forever! Once the weather changes, so does the history of humankind. By the time of his talk at the December 1972 meeting of the American Association for the Advancement of Science in Washington, DC, the sea gull had evolved into the more poetic butterfly -- the title of his talk was, "Predictability: Does the Flap of a Butterfly's Wings in Brazil set off a Tornado in Texas?" 3. Every day things are chaotic, chaos leads to creativity and life. The "Edge of Chaos" is where creativity happens! Lorenz's discovery continues to influence the scientific world, which has yet to grasp its implications fully. Chaotic systems have been recognised in all branches of science. As mathematicians started to unravel its mysteries, science reeled before the implications of an uncertain world intricately bound up with chance. The human heartbeat is chaotic, as indeed are the stock market, the solar system and of course the weather. In fact the more we learn about chaos the more closely it seems to be bound up with nature. Fractal structures seem to be everywhere we look: in ferns, cauliflowers, the coral reef, kidneys... Rather than turn its back on chaos, nature appears to use it and science is beginning to do the same. When will large scale corporate capitalism and government structures metamorphose to embrace the butterfly effect and make us live sustainably at the edge of chaos? When each one of us changes! Mahatma Gandhi said, "As human beings, our greatness lies not so much in being able to remake the world -- that is the myth of the atomic age -- as in being able to remake ourselves!" Isn't the oil gusher becoming a world wide summit and not just a US landmark, as the cascading effects concatenate? If so, should other countries and international organisations be involved? Thirteen entities had originally offered the US oil gusher assistance within about two weeks of the Deepwater Horizon explosion and that number grew to 17 countries and 5 entities by mid-June, including the governments of Canada, Croatia, France, Germany, Ireland, Mexico, the Netherlands, Norway, Romania, Republic of Korea, Spain, Sweden and the United Kingdom. The international entities include the European Maritime Safety Agency, the European Commission's Monitoring and Information Centre, the International Maritime Organization, the Environment Unit of the United Nations Office for the Coordination of Humanitarian Affairs and the United Nations Environment Program. Should those entities which have already agreed to provide humanitarian not-for-profit support for the Gulf of Mexico debacle now be involved given the G20 summit in Toronto? The ancient Hermetic axiom, from about 2,300 years ago, suggests, "As is the inner, so is the outer; as is the great, so is the small; as it is above, so it is below; there is but One Life and Law; and He, that is worth it, is One. Nothing is inner, nothing is outer; nothing is great, nothing is small; nothing is high, nothing is low; in the Divine Economy." We and our planet are an exquisitely arranged and interconnected system within the universe. What changes in one way for this complex non-linear dynamical system is going to have consequences for all of us in so many unknown ways. Chaos theory is not about disorder, it is about very complicated systems of order. The very connection, contact, or interconnections between the earth, nature, all living beings including people, societal structures and man-made machines create conditions where even the smallest point of interaction can have non-linear or seemingly chaotic and very large outcomes! Our challenge as seven billion inhabitants on one planet is to try and figure out that our small actions have a consequence, no matter how small our allotted space might be. Discipline ought to be the watchword for our controlling levers in terms of what we desire and what we consume. Consumption and demand affect procurement and supply, which means extracting more and more resources without thinking of the global eco-system as a unified habitat for other living creatures beyond ourselves! Do we only change when we are pushed to the brink by unpredictable events that threaten our way of life and survival? We still have a lot to learn about how nature uses chaos, but perhaps unpredictable behaviour is not altogether undesirable! As Henry Adams, the famous American historian, once said "Chaos often breeds life, when order breeds habit!" Will the world wide chaos unleashed by the oil gushers' Butterfly Effect lead to more sustainable patterns of consumption and production? That is the key question of the 21st century, which holds the potential to metamorphose our civilisation towards redemption or annihilation as we progress towards this world wide summit.